What a year it has been for rookie players in the NFL. We have DeMarco Murray coming out of nowhere to become the lead-back for “America’s Team”, Julio Jones is catching 60 yard bombs in Atlanta, and A.J Green is emerging as the next great NFL receiver in Cincinnati. But there are 2 young rookie Quarterbacks in Carolina and Cincinnati who have not only had a profound effect on their teams, but they have taken the league by storm this year as well. Cam Newton and Andy Dalton. These 2 are at the fore-front of the NFL Offensive Rookie of the Year race, but picking one over the other may be harder than you think. At the start of the season, it was all about Cam. The Heisman Trophy winner out of Auburn put his mark on the league right away with back-to-back 400 yard passing games to start the season. 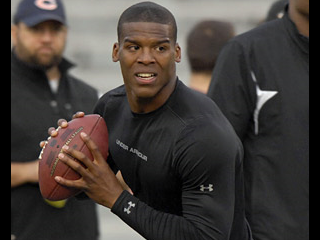 After the league had seen many a Quarterback be selected number 1 in the draft with less than stellar results (I am looking at you, JaMarcus Russell), several experts predicted that Cam Newton would join the club of rookie Quarterbacks who fail to deliver and live up to their draft selection. He had a big arm in College, and his ability to run with the football enamoured many teams, but whether or not he could become a leader and adapt to the NFL style of play remained to be seen. Cam shut up his critics right away, dazzling Carolina fans with his long-bombs to WR Steve Smith, and his countless rushing touchdowns. Within weeks, Newton had become one of the most exciting players in the entire league. The Panthers weren’t winning, but Cam had made them watchable and relevant once again. On the opposite end of the spectrum, there is Bengals Quarterback Andy Dalton, who didn’t have nearly as much fan-fare entering the league as number one pick Cam Newton did. As the quiet, red-headed kid from Texas Christian University, Dalton had slowly but surely put together quite a resume for himself for the NFL Draft. He basically broke every single QB record there was at the university, including wins (42), touchdown passes (71) and completions (812). 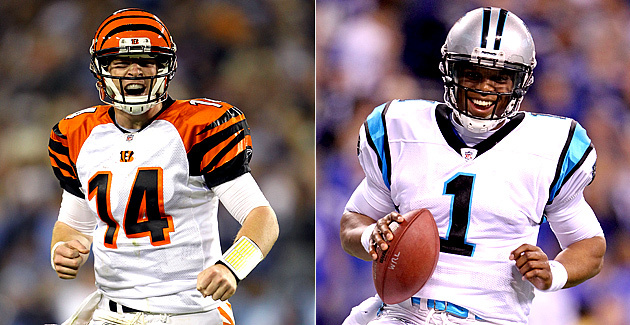 Drafted 34 picks after Cam, Dalton ended up in the perfect situation with the Bengals. The team was looking for the Quarterback of the future as Carson Palmer was ready to leave the franchise, so Andy wound up being the opening day starter, and hasn’t looked back since. Though not nearly as heralded as his counter-part Cam, Dalton has been just as effective a QB for his team, if not more so. So now comes the big question…..who is the better Quarterback right now? Who deserves to walk away with the NFL Offensive Rookie of the Year award? Well, let’s look at the numbers each player has put up after 11 weeks of action. If you looked solely at statistics, then the slight edge would probably go to Cam Newton. Cam has thrown for 500 more yards than Andy, but he has also thrown the ball more as well. Cam is also clearly the better rusher, but that is a huge part of his game. Cam has the athleticism and huge frame to be able to score those 5-10 yard goal line touchdowns. 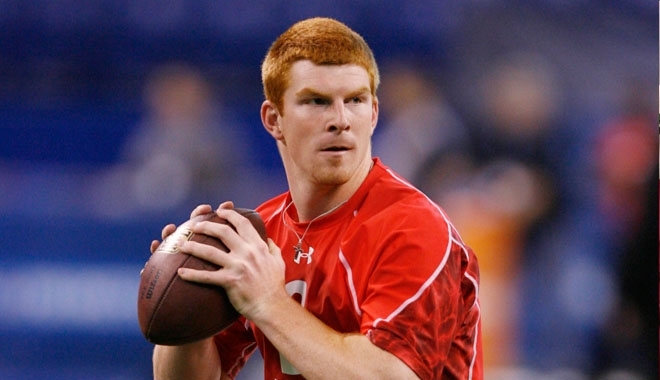 There are very few players in the league who can do that, and Andy Dalton is not one of them. Just because Cam has the ability to run with the football, doesn’t mean I am going to penalize Dalton because he can’t. Based on the actual Quarterback numbers like passing touchdowns and interceptions, then Andy does outshine Cam, if only a little bit. Dalton does have more passing touchdowns, but Cam does have 10 rushing scores on top of that. The Carolina Panthers need points in whatever way they can get them, so just because Cam scores on the ground, doesn’t mean he isn’t as good a QB as someone who doesn’t, like an Andy Dalton. Whether you put the importance on standard QB numbers like the touchdowns, picks and passing yardage over the overall scoring numbers of a player is up to you. But if you are going that route, then Dalton does deserve the nod. To me, the most important piece of information I am going to look at is which team is performing better right now. 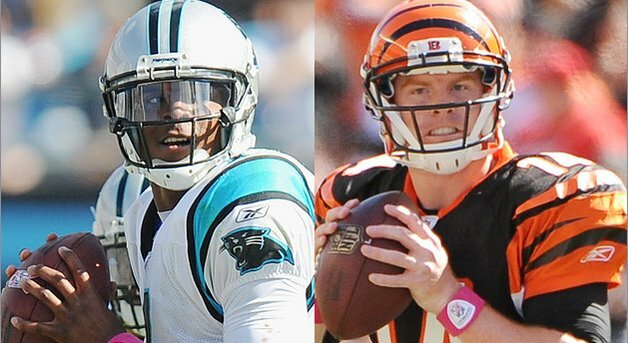 As of this writing, the Carolina Panthers are 3-8 and the Cincinnati Bengals are 7-4, which is +4 advantage for Dalton. Both players didn’t necessarily end up in winning situations, so its hard to judge which team is truly better if you take the 2 out of the equation. The Bengals do have a top-10 defense though, compared to the Panthers who have one of the worst defensive squads in the NFL. Dalton is asked to be more of a manager on the field because his defense can get him out of tight situations. Cam doesn’t have that luxury in Carolina. Both the Panthers and Bengals play in 2 of the toughest divisions in the NFL (AFC North, NFC South), with their division rivals totaling 19 and 20 wins respectively, so there is no advantage there. If you look closely though, the NFC South houses 3 of the worst pass defenses in the NFL (Falcons 23rd, Saints 28th, Buccaneers 29th) and the AFC North has 3 of the top 5 pass defenses in the NFL (Ravens 5th, Steelers 3rd, Browns 1st). Based on that statistic, it is clear that Andy Dalton has a much harder time putting up solid passing numbers in the AFC North than Cam Newton would in the NFC South. 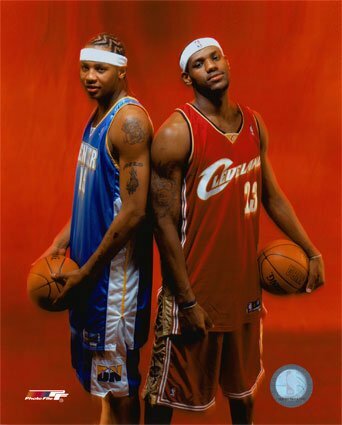 This situation reminds me of the problem I had back in 2003-04, when I had a difficult time deciding between Carmelo Anthony and Lebron James as to who should win the NBA Rookie of the Year. Carmelo Anthony had great numbers that season, and took his team to the playoffs. But Lebron James had one of the biggest statistical rookie seasons in NBA history, and that eventually overshadowed what Carmelo did in Denver, as James took home the trophy. That dilemma resembles what I am dealing with in selecting either Dalton or Newton. Do I take the guy who has been a consistent, steady leader for his team and has lead them to a near playoff birth in his first season, or do I take the guy who has broken rookie record after rookie record and has put up legendary numbers for a horrible team? Frankly, you can’t go wrong with either guy. Both guys really do deserve the award based on the seasons they are having, but only one is going to walk away as the Rookie of the Year in the NFL. So based on what they have done so far, the numbers they have produced and the wins they have for their teams, I am going to go with Andy Dalton as my personal Rookie of the Year, even though I am fairly certain the votes will go to Newton. How about you? As of right now, who is the better Quarterback and who is most deserving of the Rookie of the Year? I am not asking who has the brighter future or who is more likely to be better down the road, this is just based on what is going on right now. Let me know who you think is the most deserving below.